If you are unable to see split ends (or even if you are), your hair will still indicate to you whether it is damaged or not. As hair grows and gets older it has a tendency to taper due to loss of the cuticle. If you have split ends then logically as the hair splits the ends will get thinner over time. Today I want to talk about one heat free method to 'see' split ends. 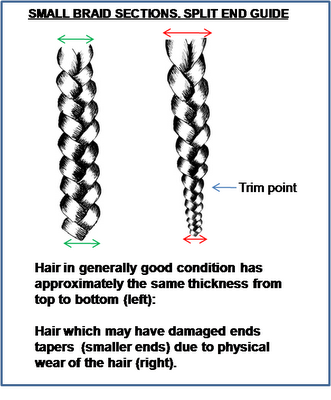 This involves braiding hair in small-ish sections (around a square inch or so) and then checking to see if the ends taper or not (See the image below). 1. Tension: You should braid with approximately the same tension. Don't increase the tension as you go along or you may get a false result. 2. Sections: Small sections are necessary since hair does not grow at the same speed. It is very possible to have much longer hair at the back than the front or vice versa. 3.Styling: If your hair has been cut into layers or weighted (thinned out in sections), this method is not useful for you unless you are growing out the layers and would be happy to loose the longer lengths. What is your method for trimming? What are the advantages or disadvantages of using this method on twists instead of braids? off topic: I just saw your comment on the healthy hair blog. Are you originally from East Africa too? Are you making the samosas with potatoes and peas with curry? They're so good! As for trimming method: I use to trim 1x a year only (since I wanted to maximize my growth). Now I trim split ends as I see them (more frequently than 1x a year). J - You can definitely use the same method on twists, I find that braids tend to compress the hair a little better but if twists are your thing, then it can work with these too! Hey Amina - Ndiyo, mimi ni Mkenya :) For everyone else, that is Swahili for Yes I am from Kenya! I do like the potatoes peas and curry version! Loo - I think if your goal is to grow longer hair then it is probably ideal to try and minimise tapering for as long as possible. 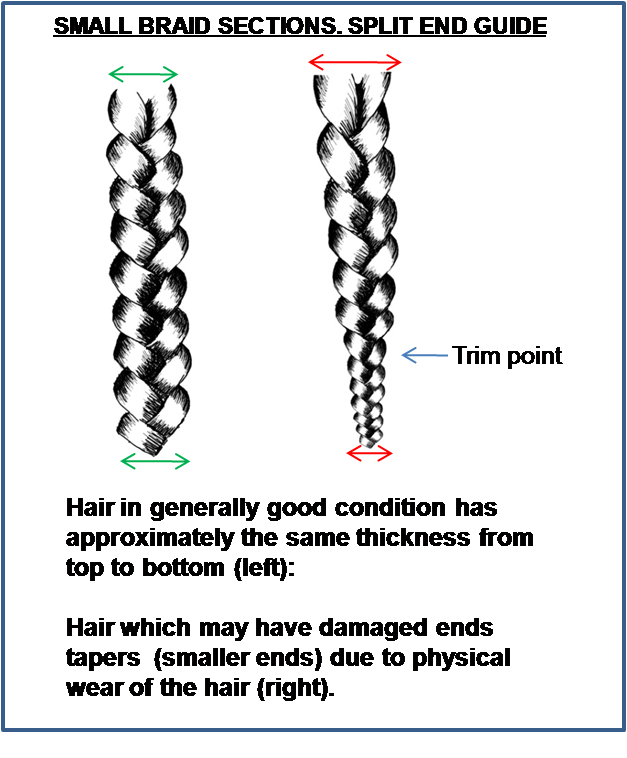 Tapering generally means the cuticle layers are getting thinner and therefore the ends are likely to split. Eventually though when hair is getting to its maximum length it will taper regardless. When I am just trimming to even my hair up ( i have a differernt method when I am getting rid of splits) , I make a part down the middle of my head bring the ends around the front, having them laying flat on my chest and cut straight accross, This gives me a U shape to my ends when my hair is straight. @hair and beyond - That would be a great method for straight hair! Anon - This is true, unfortunately with tapering ends, hanging on to this length is counterproductive. lol Amina, kweli sisi ni majirani (which means true we are neighbours!). What to do if your hair looks like the image on the left but you are sure you've seen holes and knots when squinting at individual strands? It is up to you Efuru, holes and knots are potential sites of damage, I would personally do a search and destroy for those particular strands. Some people certainly have had success with just leaving knots alone but I found that they have a tendency to start 'talking' to the neighbouring hair which then ends up in the web. Ultimately with this type of damage on an otherwise healthy strand, I would really examine the hair care and routine to identify the cause of the holes (knotting is pretty routine). It could be a case of tools (jagged nails in finger combing or teeth on a comb). It could also be a result of tight twisting or pulling of the hair. Sadly Ayomide it may mean that you need to brave it and cut some more hair. If you are only seeing a few in the midst then the more conservative search and destroy would be for you. lol asante Amina. I had one publisher show some interest but when I said that I would continue to give out the information for free on the blog, she ran for the hills lol. I do think that some people would like to have a reference text and others don't mind flipping through the archives. I feel that this information is useful and everyone should know about it. Publishers have a different angle they feel why would someone pay when they can get it for free. So free it is until I get another offer which is happy to take free!! this may be a good method for me to try with my daughter. thanks Jc! I can see how this method would work if your hair is all one length. However, if your hair is layered or thinned during professional cutting, then the braids will be thinner at the ends because there is less hair. This may be obvious, but I thought it worth mentioning. @Anon- Sure thing just let me know what you would like to know or if you are struggling with anything in particular. A really good website for haircare for kids is happygirlhair.com. Katie has adopted two girls from Ethiopia. Pendo's hair (yep I checked out your site) is very similar to one of Katie's girls. Do check it out! This is an excellent idea. I've been meaning to trim my ends for a while but not sure what the best method is. Thanks for the article. Salamu from a fellow Kenyan. I am in the states, i follow your blog and i thought i should say hi. I've been relaxer free for about 5 years and i am always scouring the web for tips on how to style my hair. Blog yako imenisaidia sana, i am so proud that mkenya mwenzangu is educating the masses (scientifically at that) Hongera sana and keep up the good work. Asante sana Nimefika. Umenifurahisha kwa sababu umetumia lugha ya taifa! (which means Thanks Nimefika, you've made my day by writing in swahili ). Natural hair is great, stick with it! Thanks for this post! I need a trimming but my budget is tight. Now I know how to cut my ends my self. The left rear portion of my hair is a poor sight. :( I can't even wear my afro out proudly b/c of the weakened hair and tangled knots that often form. I just have a question. I've heard of ladies braiding the hair but only cutting the pieces that are sticking out; is that effective? I hope so, because it seems less traumatic than cutting several inches of hair. I despise trimming :) It always seems to turn into a cut. Great Blog BTW! Anon- I think that method is a bad idea. 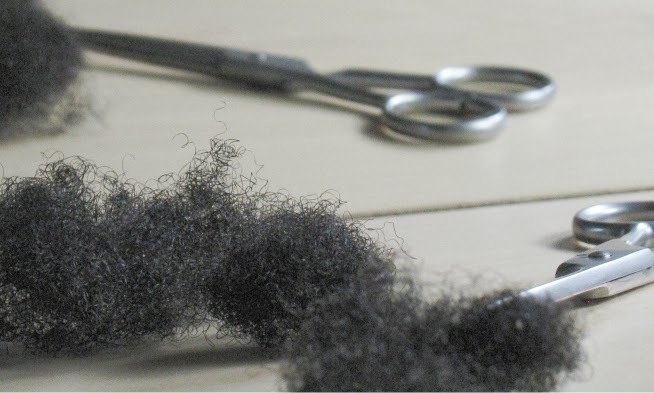 Each hair is growing in its own cyle so some hair is shorter than the next piece. Not all the hair that sticks out is in bad condition. It is always better to cut the ends in my opinion. You do NOT have to cut several inches of hair unless your hair is badly damaged. Quarter or half an inch is usually sufficient for about 6 months (for me). I just came accross this video and I wanted to have your opinion regarding this method to "trim". You told me once you were African and you may have seen this method of using fire to "clean" braids. I agree that if hair is weighted, layered or cut unevenly, this method may not work. But not all hair on one head is in the same growth phase, hair is constantly being shed and replaced. Surely then in a "perfectly healthy" (if there is any such thing!lol)head of hair there will always be hair of varying lengths which are not necessarily split. Using this method on such a head will surely lead to excessive trimming? what if you do have your hair in layers? how do you cut it that way?? Wow! Believe it or not I have been doing this method for years (10+). I was putting my hair in braids and noticed the some of the ends were funky looking, so I snipped them. I part my hair in the same place (years doing this=memorized)same amount of braids, check the ends and snip. I hope people find this helpful. Glad to have you on board. This method is best done on dry hair. This is because wet natural hair has a tendency to shrink and you can end up cutting off more than you need to. I have many hairs coming out of the sides of my two strand twist. Are these split ends, how to I trim this unruly, unsightly hair. Please help, I have been searching for years.